We have a range of PA solutions for hire, with an optional technician for set up and operation, to fit most needs. Our 250w 2.1 PA system is ideal for small to medium sized venues, and is perfect for music playback from an iPod, laptop or similar. 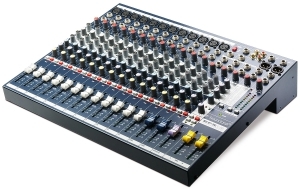 This system can also be used with a microphone making it great for presentations too! 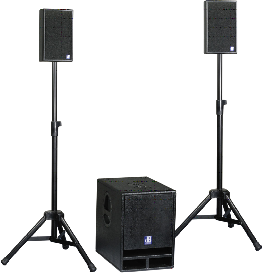 Our 600w PA system is suitable for medium to large venues for more powerful music playback. The system comes complete with a 12 channel Soundcraft mixer with built in effects, 2x wireless Sennheiser tie-clip microphones, 2x wireless Sennheiser hand held microphones, 600w Behringer amplifier, speakers and stands, all in a self contained flight case for easy transportation. For large venues or outdoor events, we are able to supply a 12+ channel PA system, including wired and wireless microphones, monitor speakers, DI boxes, stage snakes and audio playback. For more details and an accurate quote, please get in touch with your specific needs. 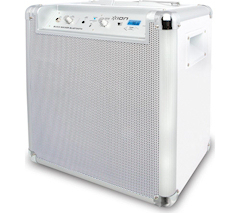 For small venues, venues with limited power, or if you just require a portable solution for music and speech we have a couple of battery powered speakers with microphone, iPod/laptop and Bluetooth connectivity.